Concentration is the key to success in virtually all aspects of life, including of course studies. When you are able to concentrate properly, it helps you focus on all your priorities with absolute efficiency by cutting yourself off any potential source of distraction. In order to concentrate better, you should have a set place to study - the quieter, the better! Also, you need to create and maintain a daily study routine after carefully examining which part of the day you are most comfortable studying in. Once you are in your study table, go ahead and focus your mind on the subject you intend to study. Don’t try too hard - that could make things only worse. Instead, try and relax, and just take it slowly. If required read out loud – but not so loud that your own voice start messing around with your concentration level. When it comes to revisions, frequently refer to your notes and assess what needs be accomplished in the follow-up steps. Attack your target chapters with a strategic planning – that’s indeed a much better way compared to randomly switching from one topic to another. You may find it hard to comprehend now - but by concentrating today, you are likely to be rewarding yourself in the near future; not just through your exam results, but in many different ways. However, if you are looking for immediate rewards without having to wait for months or weeks, just think about a special treat at the end of every successfully executed study session. Also, try not to study one topic for hours. Instead, plan your daily study routine in such a way that it includes different subject matters at different time of the day. Also, focusing hard does not necessarily mean that you must study for consecutive hours without any break in between. In fact, that’s a harmful approach that you should try and avoid at all costs. Breaks are important - especially when it comes to refresh your brain from time to time so it can perform in a better and more efficient manner. Memorizing the chapters or subject matters studied so far is one key challenge that most students are literally afraid of! But fortunately, there are numerous tried and tested memorization techniques that can help you get rid of that fear. Memory aids are best defined as the quick, short techniques that help you remember substantial portions of the syllabus within a shorter duration. For example, flash cards! These are tiny strips of paper where one can note down the important points. It serves as an excellent brain fresher and enables one fast revise large parts of the syllabus within minutes. Alternatively, you can also turn to MNEMONICS. 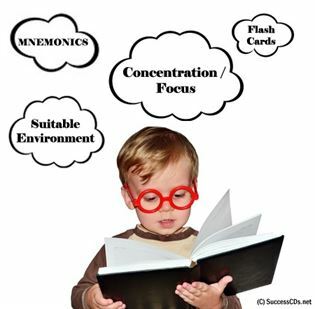 MNEMONICS is the abbreviation for Make Names Easily Memorable by Organising Nominated Initial Characters. It’s easy - just as the name suggests, simply take the first letter of every word and combine them. This is a great technique to remember formulae or definitions that you usually find difficult memorizing. Make the environment as suitable for studies as possible. Create an adequate work atmosphere - avoid relaxing during study hours. Choose your timetable in such a way that there is no clash between your study and other competing activities. In the event distractions are bothering you for awhile, it is imperative that you become intensely involved in your studies. Always keep a pen and pad of paper near you so that you can immediately pen down any irrelevant thought occupying your mind. This way, you will be effectively getting any such thoughts out of your mind onto the paper. Always break up the overall content of the study material you are focusing on and switch between different subjects in order to ensure that you are not tired by sheer monotony. Try and avoid potential source of distractions (such as mobile phones, social media and so on) from a month before the exam begins. We know, easier said than done - but doing so could bring you immense benefits.